a penalty to replace the old exile, now there is no place anymore to go to. Since we have given up our hunter gatherer habits, our planet has become overpopulated.. Quite a few people are in a state of solitary confinement. Not only common criminals. Also, people whose ideas collided with the culture in which they resided. The ever continuing growth of people belonging to this or that culture, make special demands on the captains of those cultures. To avert all kinds of evil the giant tankers of whom they conduct the administration, have to go trough rough seas of discordant ideological currents and religious tornados. At one point in time, this or that is highly taboo and another thing is in vogue again. Then again tabula rasa is made of all the above, and new, equally questionable values are applied. The French philosopher Proudhon knew it: all we need to know about known issues is already at birth ingrained in us. No religion or dogma, no ideology or ism can withstand the delicacy of our own individual conscience. So it may happen that those years of rope dancing one spends on the narrow ideological playing field of his society can still end in jail. But! One may have actually a better life down there! Finally there is freedom of thought in the solitary existence, no longer one is kneaded everyday again into a socially acceptable person. And that is actually a process: while church and state peeks inside through cracks and crevices, ever more artificial mists are rising and, if it is given, one gains access to the richness of one's own mind again. And that source of wisdom should not be underestimated: the solitary confinement can be compared to the meditating hermits who willingly separated themselves from society in order to perceive the world as it really is. Knowledge of good and evil that had always been around, but covered with thick layers of civilisation varnish and buried under taught doctrines, can now resurface. 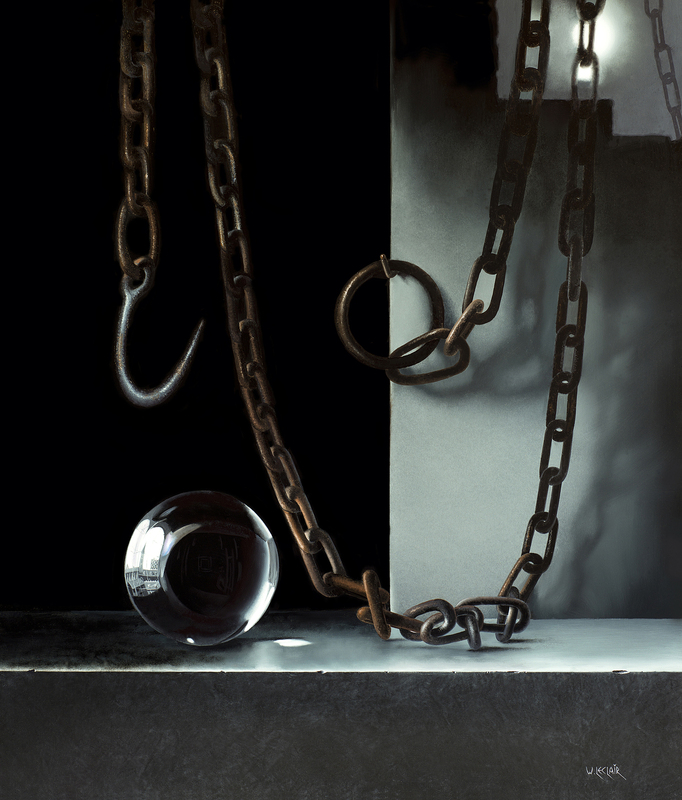 The iron ball becomes thus a crystal ball and therefore my painting, contrary to what might be assumed, is not a pessimistic misrepresentation but rather a tribute to the power of the human spirit that can not be undone.